The Empty space container (Empty Space Container in New Play Control! Pikmin 2) (亜空間コンテナ?, lit. 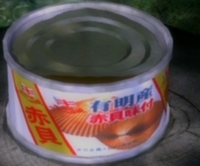 : "Subspace Container") is a treasure found in the Japanese and European versions of Pikmin 2, where it is actually an open shellfish tin of potential Japanese origin. It is found on sublevel 8 of the Cavern of Chaos, where there are a lot of Dwarf Red Bulborbs and a couple of Gatling Groinks. It is the only treasure on the sublevel. Oddly, in the GameCube version, its name is not in title case, like all other treasures. This was changed in the New Play Control! remake. Location of the Empty space container. Analysis of the Empty space container. The treasure was capitalized to "Empty Space Container" in New Play Control! Pikmin 2. Earlier location for the treasure. A screenshot of an earlier version of the game reveals that the Empty space container was going to be located on sublevel 3 of the White Flower Garden. This page was last edited on December 11, 2018, at 14:55.